Seaside’s historic landmarks inspired this vintage wedding shoot, curated by Studio Petali and photographed by Desiree Gardner Photography. When you explore the town of Seaside, hidden behind forests of cypress trees and nuzzled against the sandy shore of Florida’s Gulf Coast, you feel as if you’ve discovered a paradise frozen in time. The white picket fences, neighborly behavior, and town square take you back to a simpler, slower, quieter time. It’s the perfect scene for a vintage wedding, particularly during the spring. 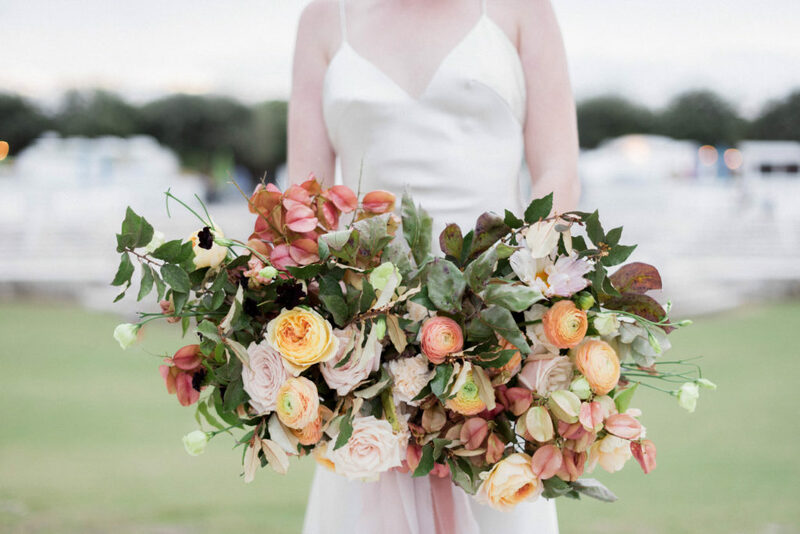 Wedding bouquet curated by Studio Petali for a vintage Seaside wedding. Spring in Seaside, Florida is a gorgeous season for weddings. Magnolia’s are preparing to bloom and fill the air with their delightful aroma. In addition, the weather isn’t as swelteringly hot as it gets mid-summer. Rather it is comfortably warm with a gentle ocean breeze. 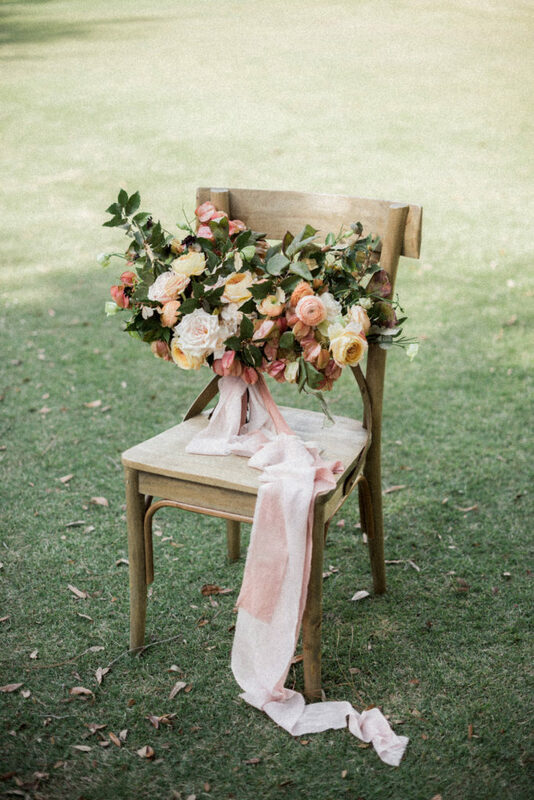 Studio Petali curated this timeless, vintage wedding shoot with a pink, yellow, and orange color palate. Muted hues of these sunset colors formed a sweet and romantic aesthetic, perfect for the classic bride. Her satin wedding gown and traditional, face-covering veil added a vintage sentiment. The beautiful bride carries her wedding bouquet through Seaside Square. The oversize wedding bouquet was accented by spools of pink ribbon draped long to the ground. 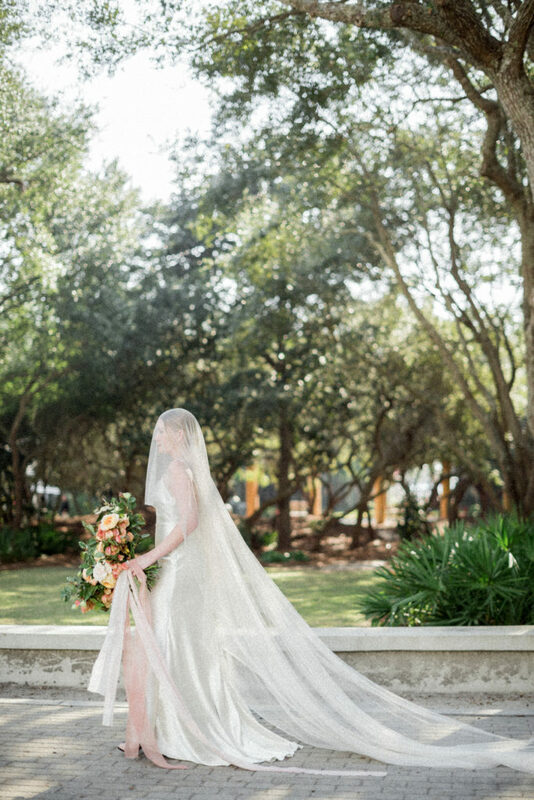 The bride looked elegant as she walked through Seaside’s iconic and historical landmarks with her train, veil, and ribbons trailing behind her. We visited two iconic Seaside landmarks for this shoot: Seaside Chapel and Seaside Square. Both of these locations are fitting venues for weddings in Seaside due to their beauty and sentimental quality. The chapel is Seaside’s tallest building, although it’s far from a skyscraper. 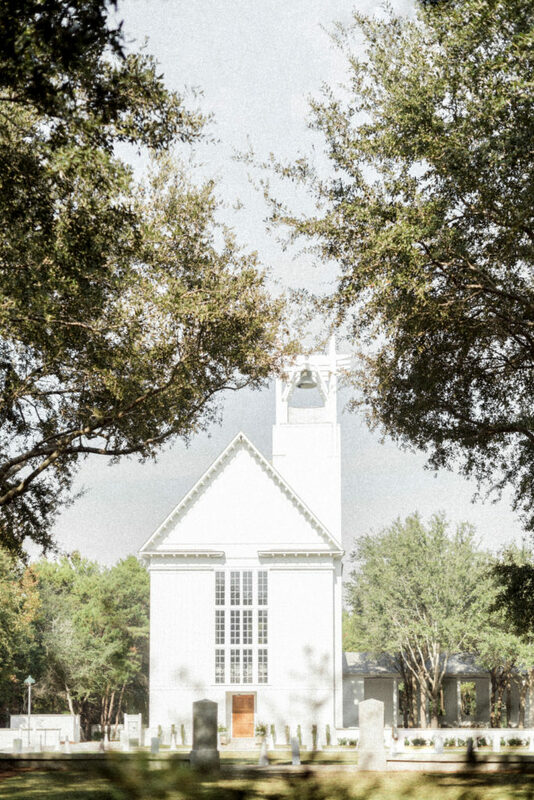 This small, intimate chapel lends the perfect setting for a traditional church wedding on 30A. Its all white architecture with a steeply pitched roof and elegant bell tower communicates a place of worship, peace, and holy celebration. The interdenominational chapel is open to all, and it is very popular for wedding ceremonies, receptions, and special events. Seaside Chapel is a popular church wedding venue on 30A. Seaside Square is the town center. Within the Square you’ll find a number of wedding venues, shops, cafes, and more. It’s the center of all the most important activities in Seaside. The large amphitheater in the center of the square hosts outdoor concerts and movies under the stars. The post office is a central landmark of the square, unassuming and charming at once. Artists also occupy the square, setting up their galleries and participating in the weekly Seaside farmer’s market. All that goes on in the square is an essential part of what makes Seaside such a beautiful place to live, visit, and most of all to celebrate a wedding. There is an appreciation for life and for love here that never fades and only grows more apparent the longer you stick around. Floral design by Studio Petali for a Seaside, Florida wedding. Studio Petali specializes in curating elegant and timeless weddings. We can assist you with flowers, decorations, event styling, photo shoot styling, and all the elements of your wedding design. Contact us today to discuss our wedding styling packages and other services. We’re based out of 30A, Florida and service all the 30A neighborhoods, including Seaside and Alys Beach.